The spectacular audio launch of Rajinikanth and Akshay Kumar-starrer 2.0 will be held at Dubai’s Burj Park — a sprawling 11,300 sq mtr lawn just a stone’s throw away from the 160-storeyed Burj Khalifa, the tallest structure in the world — Firstpost has exclusively learned. The audio launch will take place on 27 October at Burj Park, and the team has also organised a press conference on 26 October at the Burj Al Arab Jumeirah, the world’s third tallest hotel. 2.0‘s makers, Lyca Productions decided to leave no stone unturned to make this the best audio launch event ever for an Indian film. The makers have earmarked Rs 12 crores to establish the audio launch as the first-of-its-kind movie-related ceremony. AR Rahman will perform live at the event, apart from a host other exciting performances and stage shows. The teaser of the movie, which is being helmed by maverick director Shankar, will be unveiled at another massive event in Hyderabad, on 22 November, at the Shilpakala Vedika auditorium. The trailer launch of the film, which also marks Bollywood star Akshay Kumar’s Tamil debut in the role of a villain, will be held in Rajinikanth’s home city of Chennai in a third, huge event. Though the trailer launch date is not finalised yet, the makers are reportedly trying to plan it for 12 December, to coincide with Rajinikanth’s birthday. While the talkie portion of 2.0 was completed a while ago, director Shankar is gearing up for the final song shoot which begins tomorrow. Amy Jackson, who plays an important role in the film and is collaborating with Shankar for the second consecutive time after Vikram-starrer I, has been rehearsing for the song over the past few days. The track will be filmed on Rajinikanth and Amy Jackson. “The team has already initiated talks with Twitter, Facebook and Google for possible collaborations. An official announcement of each partnership will be revealed at regular intervals over the next few weeks. Apart from launching a dedicated emoji on Twitter, audiences can also expect certain new things on the micro-blogging platform for the film,” informs a source in the know. 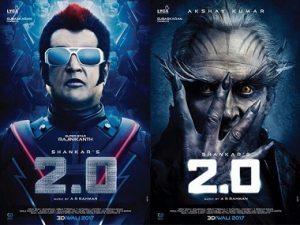 Made at a whopping budget of Rs 400 crores, 2.0 has music composed by Rahman. Cinematographer Nirav Shah, who has joined forces with Shankar for the first time, has shot the film in stereoscopic 3D. “With stereoscopic 3D, which comprises two camera pods and multiple cameras attached to each pod, it’s easy to obtain pristine, native 3D images instead of the conventional 2D to 3D conversion process which takes place in the post-production,” the source adds. CJ Sarachene, best known for working in popular Hollywood films such as Chronicles of Narnia and Night at the Museum, is managing the animation effects in the movie. While national award-winning VFX expert Srinivas Mohan, who earned rave reviews for his work in the first installment of the Baahubali series, is taking care of the visual effects, academy-award winning technician Resul Pookutty is working on the sound design. The makers recently released a 3D featurette to bring audiences up to speed with the technology. “I was mesmerised when I saw the first shot in 3D on the screen. I watched it repeatedly,” said Rajinikanth in the making-of video. While Akshay Kumar noted working in 3D was much harder than he imagined, director Shankar reiterated that they have made the film in 3D, not as a gimmick but because the script demanded it. Rajinikanth will return as Dr Vaseegaran, and the evil robot Chitti in this sequel and Akshay Kumar is said to be playing the role of a scientist named Dr Richard. The satellite rights of the film, which is Asia’s costliest natively acquired 3D project ever, have been bought by Zee Network for Tamil, Telugu, and Hindi languages at Rs 110 crores. Amazon Prime has reportedly secured the digital rights to the film for a pricey sum.